CoaguChek XS 48 PT Test Strips: Box with 2 vials of 24 strips each with a code chip. 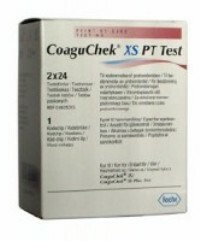 Coaguchek XS PT strips are also available in boxes of 24. To visit the product click on Coaguchek XS PT Strips 24.